List of Major Ocean Currents of the World, Trick to Remember: Major Ocean Currents of the World is one of Subtopic under Geography of World and India which is one of main 11 Topics in RAS Pre Examination as per RAS Exam New Pattern from 2013, RAS 2016 and so on. www.rasexam.com will cover Notes on all topics of RAS Pre, Mains for RAS and other competitive examinations. 1. Surface currents constitute about 10 per cent of all the water in the ocean, these waters are the upper 400 m of the ocean. 2. Deep water currents make up the other 90 per cent of the ocean water. 2. Warm currents bring warm water into cold water areas and are usually observed on the east coast of continents in the low and middle latitudes. In the northern hemisphere they are found on the west coasts of continents in high latitudes. Tips to Remember: Just Remember the Cold current as they are lesser in Number, Rest all are warm currents. 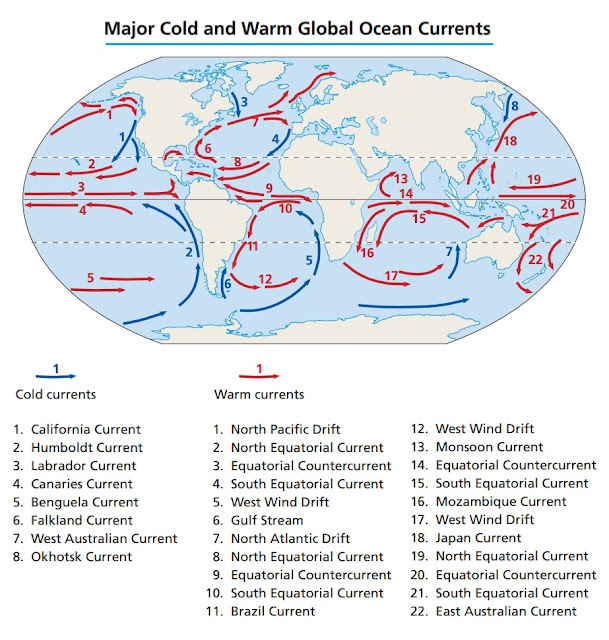 Here is Tips to Remember 10 Major Cold Ocean Currents. California Human Can be Ok in Australian Wind with Lab SoFa.